This entry was posted on November 26, 2018. In the past, halogen work lighting was the go-to staple, but these units would generate an extreme amount of heat, need constant bulb replacement or simply not work when needed. Although relatively inexpensive, you got what you paid for. The New LED Tower Light (SKU 4324) has none of these issues. The long lasting and cool to the touch LEDs never need replacing, and with its the shape, the Tower provides up to 300° of area light coverage. The Tower produces 3200 lumens of bright white light, comparable to 175W standard light bulb, yet only consumes 42W of energy. The body is comprised of a metal housing with heavy duty bumper, and a lock-in-place tripod stand. 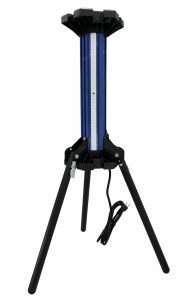 Fully deployed, the LED Tower Light stands 85cm high.